Journalism and Climate Crisis: Public Engagement, Media Alternatives recognizes that climate change is more than an environmental crisis. It is also a question of political and communicative capacity. This book enquires into which approaches to journalism, as a particularly important form of public communication, can best enable humanity to productively address climate crisis. The book combines selective overviews of previous research, normative enquiry (what should journalism be doing?) and original empirical case studies of environmental communication and media coverage in Australia and Canada. 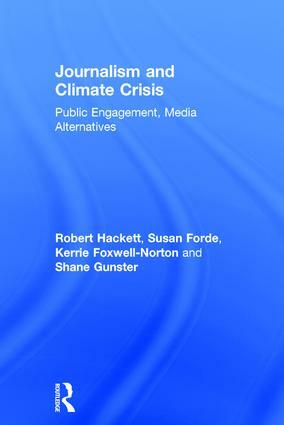 Bringing together perspectives from the fields of environmental communication and journalism studies, the authors argue for forms of journalism that can encourage public engagement and mobilization to challenge the powerful interests vested in a high-carbon economy – ‘facilitative’ and ‘radical’ roles particularly well-suited to alternative media and alternative journalism. Ultimately, the book argues for a fundamental rethinking of relationships between journalism, publics, democracy and climate crisis. This book will interest researchers, students and activists in environmental politics, social movements and the media. Robert A. Hackett is Professor of Communication at Simon Fraser University, Vancouver and a co-founder of NewsWatch Canada, Media Democracy Days and OpenMedia.ca. His research interests include media democratization; critical news analysis; and social movements, peace and media. Recent collaborative books include Expanding Peace Journalism and Remaking Media. Susan Forde is Director of the Griffith Centre for Social and Cultural Research and Associate Professor of Journalism at Griffith University, Australia. Books include Challenging the News and Developing Dialogues (with Meadows and Foxwell). Until 2002 she was a journalist in the alternative, independent and Indigenous media, including editing the Indigenous newspaper Land Rights Queensland. Shane Gunster is Associate Professor in the School of Communication at Simon Fraser University and a research associate with the Canadian Centre for Policy Alternatives. His teaching and research interests focus upon news media coverage, advocacy and engagement around the politics of energy and climate change. Kerrie Foxwell-Norton is Senior Lecturer in Journalism and Media Studies at Griffith University, Australia. Her research investigates the role of local media and communities in addressing global environmental issues, and her key interest is in the intersections between media, policy and the environment. She is the co-author of Developing Dialogues (with Forde and Meadows).